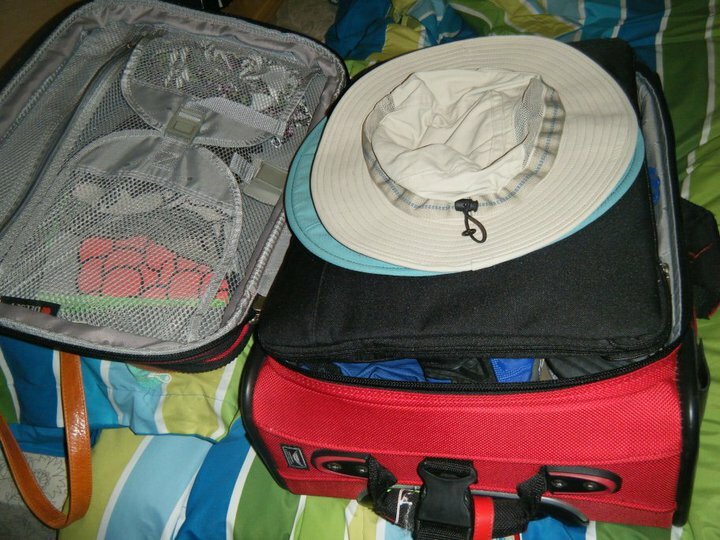 What’s the most important thing to take with you on vacation? Luggage, of course! I mean, you could try stuffing extra t-shirts and underwear in your pockets and see what happens when you get to security, but that seems unrealistic, unless your clothes are REALLY small or you only plan to wear three outfits on your trip and you’ve fashioned a second pair of pants into some sort of belt in order to take them. (Actually, this might be a fun thing to try on a short trip, just to see what the TSA agents think when they see you pull 6 random pieces of clothing out of your pants and dump them in a bin to go through the x-ray machine. Just don’t tell them I put you up to it.) For those of you who are more organized and like to bring clothing that isn’t wrinkled, you’re probably going to buy a carry-on bag. I never use the word suitcase anymore, because it brings to mind some big bag that requires wheels to drag along the closet-full of stuff you packed that you have to check at the front desk and then pay money for. Why pay $15, $25 or even $40 each way for a bag full of clothes when you can take a reasonable amount of clothing in a smaller bag that doesn’t need to be checked and doesn’t cost you anything…except maybe a little upper arm strength? You already PAID to use the bag, you shouldn’t have to pay to take it on vacation, too. Get more tips, deals and product/website suggestions by going to Facebook and clicking the "Like" Shereen Travels Cheap or going to Twitter and following Shereentrvlschp. It's really easy and you'll get several updates and/or tweets a day from me. It's great if you are planning a trip and see me post a deal for your chosen destination. You can also always post on my Facebook wall and ask me questions. Have a job and a life and can't monitor social networking sites 24/7? Well, join the club...and then go sign up for NutshellMail. You customize the newsletter you get by choosing who you want to see posts from and how much, then decide how often you want to receive your newsletter and it'll be emailed to you with all the posts and tweets up to that time. Don't forget to add Shereen Travels Cheap and @shereentrvlschp to your list of favorites! Honestly, in the last few years my husband and I have taken one large carry-on and one small carry-on, total, for all our clothing, electronics and toiletries and have never once wished we’d brought more (except for when I forgot the charger tip for the iPod or the time I forgot socks). My point is, if I can get TWO people’s clothing for a two-week vacation into one bag, with a slight overflow for shoes in a smaller bag, then you should be able to pack all of your own stuff in one bag and still have room left over for souvenirs. If you think I’m lying, you can see my packing prowess through photos here and on my Facebook page. We’ve never lost a bag, but have come close. I really don’t want to be stuck with only two outfits for my entire trip if they can’t locate the bag that has all my stuff in it. Also, it allows us to travel lighter and just roll from the gate to the taxi stand. I love packing and I love luggage, but I do try to limit my options when it comes to carry-on bags, because having too many to choose from at my disposal is just a recipe for overpacking on my part. Do you have a great carry-on bag? Do you need a great carry-on bag? If you don’t know how to find one, then that’s where I come in. Depending on what you need to bring with you, where you’ll be going and how you’ll be getting around, different bags can help or hinder your travels. If you plan on hiking through the jungle with all your belongings with you, a wheelie bag is certainly not going to be your friend. Are you a follower of my blog? Well, why not subscribe then? You can do so on the right. If you have a Kindle, you can subscribe via Amazon and take me everywhere you go. If not, you can still subscribe via Amazon and download the free Kindle reading app for your preferred web-enabled device, whether it's an iPad or an Android phone. So, what is it you want in a bag? For me, it’s several things. Whether or not I plan to travel with my husband, I want a carry-on with wheels that isn’t black, like everyone else’s is. It’s hard to find a non-black bag sometimes. And it’s even harder to find one that has enough pockets and compartments to separate clothing and other items. If there’s one thing I hate is a bag that is basically just a box with wheels. Sure, all my clothes are going to go in there, but can I at least have a zipper compartment for underwear or socks? 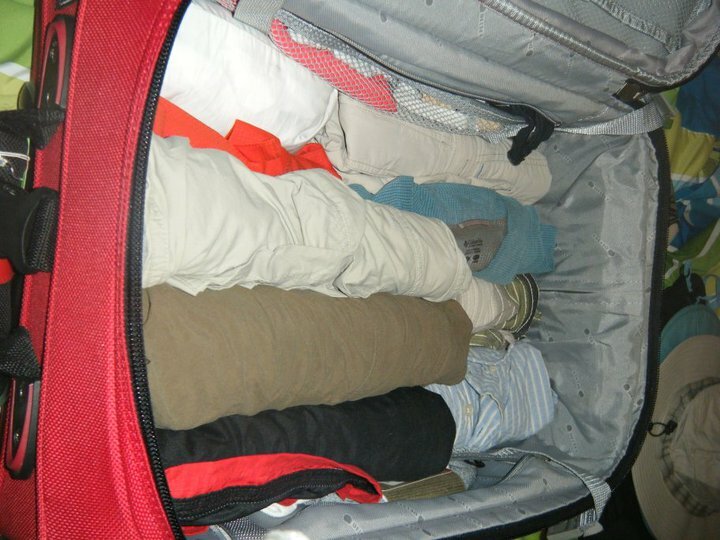 My carry-on is my closet away from home and I like it to be usable while I’m traveling. Do you want a bag that fits under the seat in front of you or one that is fine going in the overhead? Keep in mind that not all planes have enough overhead capacity to fit your bag, but in these cases you are usually not charged, given a hang-tag to put on your bag’s handle and are asked to leave it with the luggage attendant. This is fine, unless you packed all your entertainment in that bag, too. If it’s the only bag you plan on taking, make sure you have a folding tote that you can toss some goodies in before boarding and use as a backup carry-on…especially if you have your laptop packed in there. You don’t want it “accidentally” smashed to bits when they are carefully putting your bag in the cargo hold. 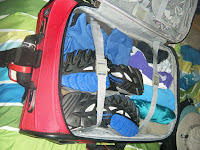 When I fly alone, I take whichever bag is going to hold the amount of clothes I need and an extra pair of shoes. Usually, my smaller roller-bag that fits under the seat in front of me is fine for such things and I can even throw in a few gifts to bring with me. If I plan on buying stuff, I will bring my bigger roller bag and put it in the overhead bin. Regardless, I always take what I call my “travel purse”. I have a variety of them, but they are always bigger than my regular purse and have room for snacks, my Kindle, iPod, camera travel docs and a magazine, along with my normal purse contents. Want even more deals? Subscribe to the #traveldeals Daily and get a newspaper page full of deals posted by tweeters like me! When I fly with my husband, we take both the big carry-on and the small carry-on and my “travel purse”. All of our clothes fit in the big one, which he hefts into the overhead, the smaller one has extra shoes, iGo charging cables & tips and toiletries and fits under the seat. Snacks and electronics still go in my “purse” and we have everything we need for our trip with us all the time. We don’t pay extra to check bags and we don’t have to waste up to 45 minutes at the baggage carousel with a bunch of other cranky travelersor risk that something useful will have been taken from our bag when they do those random bag screenings. My travel motto is: The less you take, the less you have to carry. You DO have to carry all that stuff at some point. What if you get to your destination and then have to take the subway? There may not be an elevator. Or get to your hotel and the lift is broken…or doesn’t exist? Can you drag your bags up and down many flights of stairs without wanting to leave it on the street for the homelessto find? Wheels are great and all, but they won’t help make your bag lighter or easier to carry. Will you be traveling to remote parts where there may or may not be sidewalks or even streets? Then maybe looking into getting a backpack carry-on is more suited for that. You’ll certainly notice if you packed too much with one of these, because you don’t have a choice but to carry it everywhere. It’s possible you travel in many different terrains and need multiple bags for different travel situations. Like rainy destinations might make you consider a nice hard-sided carry-on. Or you might be like us who have found that our two sizes of bags suit us for pretty much all of our travel. Keep in mind that you want a sturdy bag that’s going to hold up to travel for many years, so you don’t have to buy a new one each year. If the handle breaks or the wheels fall off after one or two trips, you need a better bag. This is the time to not skimp on quality and if you think that spending $300 on a good bag is a waste of money, think how much a replacement bag every few years will add up to. Now, you all know my favorite bag is the Delsey Helium Breeze Expandable Carry-On, but there are millions of other styles out there. Rick Steves is all about carrying everything with you on your back and has some great backpacks in all sizes for any kind of trip. There are also the ultra lightweight bags, which can come in super handy on intra-European flights, since the weight restrictions can be very strictand they will weigh your bag before you are allowed on the plane. They don't care if you can carry it. Check out some of these options. I’ve separated the bigger sizes from the smaller sizes, depending on which you are looking for. Speaking of travel bags, don’t forget to “like” Shereen Travels Cheap on Facebook to have a chance at winning one of the two great bags from Travelon that we have to give away. One is an awesome toiletry bag and the other is a packable tote/backpack. Both will make nice travel companions on any trip or a gift for the traveler in your life. You never know what might come with these bags either, so help us make it to 500 page members for us to give them away. Also, remember that you’ll receive a fun travel referral gift if one of your friends is the winner, so the more people you get to join, the more chances you’ll have to win. I haven’t decided on the prizes yet, but you might be seeing an iGo or something similarly useful in your mailbox if that person is you! Winners/referrers don’t need to live in the U.S.to win, so suggest Shereen Travels Cheap to everyone you know…especially your 300 game friends! We’ll be doing similar giveaways after this one, too. If you don’t win this time, you’ll have a chance to win again later. Are my topics not doing it for you? Looking for something more in-depth on Paraguay or the iGo or traveling by train? Well, take my survey and let me know...or you can always jump on Facebook and write on my wall. Looking for some cool new gadgets for your travel bag? Me, too! Okay, I probably have everything I’ll ever need for quite a long time, but I’ll share with you what I have and what I want. Harness the power of the sun to charge all your gadgets with the Solio solar-powered gadget charger. This is a MUST gift for someone who travels off the beaten path or backpacks…it’s also pretty cool if you end up stranded with no electricity. Solio is pocket sized and flips open to reveal little high-efficiency solar panels that will soak up the sun’s energy and put it directly into your phone or iPod or whatever else you take with you that you can’t live without. The Mono and Rocsta versions have just one panel and will give you 80+ hours of playtime and 6.5 hours of talktime, while the Classic has 3 panels will give you 132+ and 10 hours of each. The Rocsta even has a carabiner clip, so you can attach it to your backpack, your belt or whatever else you want. And if you are near civilization, no problem, because you can also plug the Solio into a USB port and recharge it for extra power for your devices later. I think these are just about the coolest things ever. eBook readers. Yeah, I know. I’m like a broken record with these things, but come on! You can buy a book virtually ANYwhere and take your entire library with you wherever you go. It’s my most favorite electronic I own. If it could also make phone calls and play games, I’d never take anything else on vacation with me. You know, besides clothes. Sony PSP. Even though this has been around for forever, I still find this to be a marvel of an electronic gadget. I don’t personally own one, but I did buy one for my dad. He can figure out how to play games on it with all the buttons and joysticks and whatnot. I’ll stick with my Nintendo DS: 4 directions, 2 buttons and a pen. Easy. If I COULD figure out how to play the games on the PSP, I’d have bought one long ago, since it also can be used as a DVDplayer, mp3 player, picture viewer, internet browser, GPSand probably a bunch more that I’m unaware of. If it streamed Netflix movies, let me read books and had a pull-out keyboard, it would be the ultimate travel device. And you know what else I heard? Sony wants to make a PSP version that is also a phone. Your travel bag just got SO much lighter! Apple iPad. I seriously hate that I don’t have such a burning hatred for this device anymore, but what are you gonna do? While it’s still too heavy to read books on or surf the Internet for very long, it has such huge capabilities for gaming, blogging, movie watching and even playing music. I think this is really the parents’ best friend on travels, because it has so many things packed into one easily usable device that it can keep your kid entertained on even those 15-hour transcontinental flights. And yes, I realize I just recommended you buy a $500 device for your 5 year old, but I really think you'll be glad you did. You can even use it for email if you want. Probably after they go to bed. Are you a bad sleeper anywhere that doesn’t involve a bed? I’m not, but I travel with those that are. You know what I tell them? Get a sleep mask! You can buy a decent one at the store for as little as $3, it blocks out all light and allows you to feel like it’s night anywhere you are. It’s especially handy when you end up in a hotel room that doesn’t have very good window coverings and the sun wakes you up at 5am. I hate that. I also tend to have sensitive eyes and a sleep mask keeps me from rubbing them or anything horrendously accidental I’ve been known to afflict myself with in the middle of the night. This here's my favorite one by Samsonite, but next to it I added one that is for those that don't like stuff right up next to their face and eyes. Sure, it looks like a bra for your face, but if you can sleep, you won't care. Do you also sleep badly if there’s noise? Though I’ve been known to sleep through a 5-hour flight with a child screaming bloody murderthe whole time 3 seats away, I also always bring a pair of earplugs with me. When everything just gets so annoying that you need to muffle the real world, these are lightweight and totally do the trick. I prefer Hearos. They mold to your ear, come with a handy little case and usually are sold with a bunch of sets, in case you lose one or your travel companions didn’t bring any and you need to come to their rescue. (Hey, maybe that's why they're called Hearos!) If that’s too low-tech for you and not quite enough buffer between your ears and everything else, get yourself a set of noise-canceling headphones. A good pair will set you back a pretty penny (usually around $99 or more), but the peace you’ll get from being able to sleep or be in your own personal bubble will be worth it. Folding laundry basket. You don’t think this counts as a gadget? Well, I beg to differ. Doing laundry is a chore, sure, but bringing two to three times as much clothing as you absolutely have to just doesn’t work for travelers anymore. I have a mesh folding laundry basket that takes up very little space in my bag. When we get to our destination and unpack, I unfold it and put it in a corner or in the closet on the floor. As we wear clothes, we use it as a hamper, then when we need to do a loadof wash, we pick it up and carry it to the laundry facilities. It has heavy-duty handles and also several pockets, which I use to carry change, detergent and some sort of entertainment. This thing is even sturdy enough to bring back a whole bunch of wet clothes, if we want to save money on drying and hang them up in the room (trust me, in places like Europe where it can end up costing $8 to run the dryer and actually get your clothes dry, it’s worth it to use your muscles to bring the wet clothes back with you. If you can wash stuff in the sink, that’s even better.) Here is the basket I have, which I think is super, but there are many different options for you. You can even take a trip to Target and test out the several styles they sell there to see which you prefer. Okay, that’s it for me today. 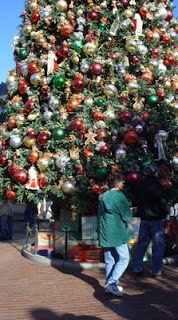 Have a safe and happy holiday and I’ll check in with you again on Wednesday. If you have any of these “gadgets”, write a comment and let me know what you think of them. If they’re really great, tell me, so I can be jealous if I don’t have them yet! Don’t forget to watch this space for new posts and updates on featured posts by ME! Yeah, yeah, I’m all about myself sometimes…but still, please check out the following websites that are very informative and have been kind enough to let me write for them and promote myself. I’d also like to thank WhichBudget.com and Airlikes.com for giving my blog numbers a nice boost with their reposting of my website reviews for their pages on both their Facebook and Twitter accounts.